Canada is fundamentally a hybridised place, embodying multiple differences in the same country and torn/strengthened by contrasting pulls of culture. This hybridity, and ability to alternate between different forms is best expressed in the werewolf and this is why the werewolf has become such an interesting medium for Canadian duality or multiplicity. We are multiple and ever changing, shifting between diverse forms and expressions. Canada’s bilingual and bicultural policy embeds in it a binary, a duality that echoes the transformation of the werewolf. It’s multicultural policy shows the fluctuations of identity and the multiplicity of identity that the werewolf can also express. We are not set and unchanging, but, rather, Canada defines itself by its changeability, by its multiplicity just as the werewolf is defined by its ability to shift and take new forms. The werewolf represents the challenge of balancing a multiplicity and shifting of existence and the idea that shifts of form are not easy, but require constant vigilance and self awareness. Here are a few werewolf stories that have really spoken to me and helped me to question existence and be comfortable with the changeability of identity and the ability to live in the question and not try to force anything into my ideas of stability. A great book that uses the werewolf as a symbol of feminine empowerment. It positions the heroine as the only female werewolf in the world, dealing with the conflicts between her own desire for the ‘normal life’ and the call of a new form of heritage. She challenges the masculinity inherent in a lot of werewolf horror. Deals with issues of intolerance and religious persecution. Set in a small town, this novel is about the secrecy of identity, and the need to hide aspects of the self that are different from the mainstream culture around oneself. Treats the werewolf as a point between the medical and the mystical. Hayter’s werewolves are subject to medical treatment, control, and suppression. Positions the struggle between assumption about identity and the truth of identity. This is a novel that reveals that the surface aspects of identity are often the least important. Werewolf meets alien in apocalyptic future. This werewolf, already hybridised, encounters an alien that is based on assimilation, bringing new and unique biological forms into its own body and incorporating diversity into itself. Positions the man as fundamentally werewolfish, embodying a changeable identity and shifting from when he is inside the house, to when he is outside the home in a space that he defines as one in which he can express his masculinity. Douglas Smith’s Out of the Light in Chimerascope. Creates a distinctly urban were creatures and causes the reader and characters to question the image of the natural were, out in the scary woods and reminds us that the city itself is a frightening environment of changeability and shifts. Not every creature of darkness lurks in the shadows and shadows need light to take form. This film plays with ideas of gender and the coming-of-age theme through the werewolf medium. It deals with ideas of sisterhood, family, and the straining bonds of family that come with radical change. This entry was posted in Editorials and tagged aging, alien, apocalypse, Charles de Lint, Claude Lalumiere, Douglas Smith, Editorials, gender, Ginger Snaps, heritage, identity, intolerance, John Fawcett, Kelley Armstrong, Margaret Atwood, medical, Monstrosity, outsider, Sparkle Hayter, Tanya Huff, urban, Werewolf Wednesdays, werewolves. Great list! I’ve read/seen some of these, but not all. I’d add an interesting Canadian werewolf (ironically, written by an American) in Chey Clark, from David Wellington’s Frostbite. She seeks revenge for her father’s death at the fangs of another werewolf, a Canadian First World War veteran who’s isolated himself in the far North. Interesting lycanthropic mythos in his novels that delves into prehistoric and pre-human era of North America. Oh, I will have to check this out! I have always held that Ginger Snaps and it’s sequel (the third AU/prequel movie was disappointing in many ways) are the two best werewolf movies ever made. The story of an early French settler finding herself married to the titular monster and inheriting his curse. I have often used Ginger Snaps in my werewolf course to teach students about the potential of the werewolf to complicate ideas of gender and to complicate dichotomies and dichotomous thinking. Ginger Snaps is pretty fantastic. Oh, I haven’t encountered Tanglefoot’s song Loup Garou before. The lyrics look amazing. I was able to hear a sample of it on Tanglefoot’s website. I will have to get a copy for the next time I teach my werewolf course. Thank you for sending this Michael! if you get the chance and give me suggestions. . . Now I recall why I used to adore this blog. Thank you, I will try and check back more often. . How often do you update your blog nowadays? I am generally updating almost daily. Some days I post reviews, sometimes quotes, interviews, or editorials. I like a lot of variety, so I have been trying to include a lot of diverse material. 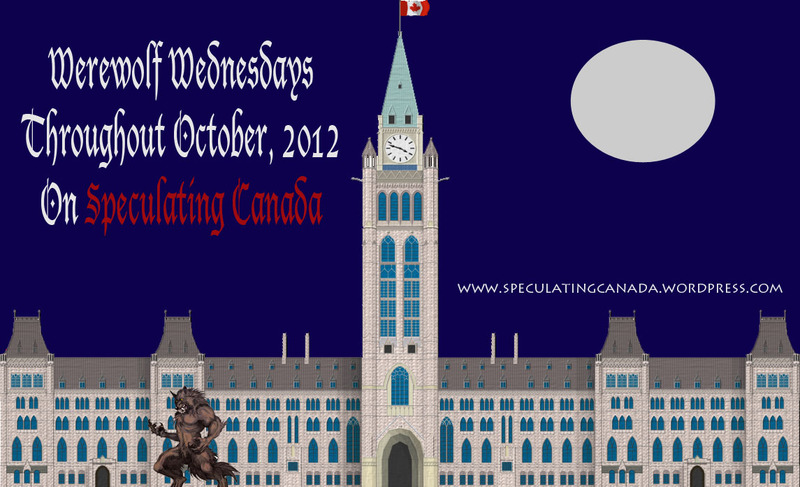 I am really glad that you are enjoying Speculating Canada. If you are a Facebook user, you can check us out on Facebook as well where I will be posting a variety of questions and opportunities for interaction and discussion. Thanks again.